The wagyu was tender and smoky, while the corn was fantastically buttery and perfectly charred. Fairly average ribs that were a bit dry and required extra sauce. The Mac Cheese was also quite average (although I am comparing it to the delicious Lobster Mac Cheese I had at Meatmaiden). 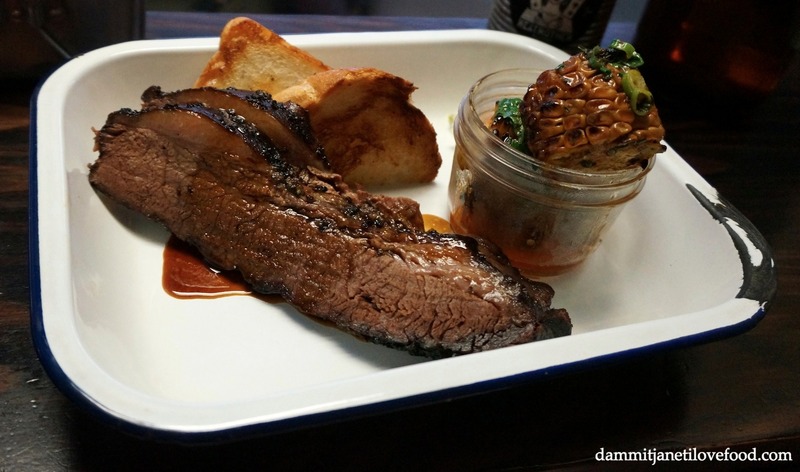 This cosy little barbecue shack is a great place to head to for all you carnivores out there. Each day meat is smoked over oak for up to 12 hours which allows for the flavours to really sink in. Meat trays are offered at dinner which include the choice of one meat, one side and a serve of Texas toast (thick buttery golden brown toast). Bun trays are also available at dinner which come with the choice of a bun and a side. Service here was easy-going and the atmosphere very relaxed. Note that they only take reservations for groups of 8 people and over, and that this place is closed on Mondays. Pingback: Meatmaiden | "Dammit Janet I Love Food"